Home » Divisions » Division 2 Recap!!! Divisional Championships Meet Hub – for broadcasts, interviews, pics! The 2017 girls D2 Championships had 6 teams with a legitimate shot at a title heading into the meet. Milford, Portsmouth, Lebanon, Merrimack Valley, Oyster River and Souhegan all conceivably had enough firepower to claim a title, but as we all know what’s true on paper is often very different in the heat of competition. The day started off with the 4×800, with Souhegan rolling easily to a new division record in 9:34.19! Con-Val and Hollis/Brookline went sub 10 minutes as well, and Portsmouth squeezed out a 6th. In the 100 Hurdles Kaitlyn Covell of Merrimack Valley had a smooth win in 16.17 with Portsmouth’s Georgia Dickinson not far behind comfortably in second with a 16.65. The 100 Meter Dash saw Milford’s Viankah Williams upset top seed Jordan Meier of Plymouth for the win in 12.65 to Meier’s 12.83, with Acadia Momm-White of Portsmouth just behind them in 3rd with 12.87. Oyster River’s Xiana Twombly and Devan McLain took 4th and 5th respectively. The 1600 was a tight race for big stakes, and Milford’s Rebecca Durham (4:53.62) out=dueled Madeleine Hunt (4:54.16) of Souhegan for 1st. Merrimack Valley’s Kristie Schoffield started a long day with many difficult events placed 3rd here. Milford grabbed another point with Alex Matsis in 6th. In an electrifying 4×100, the top 3 teams all were in the team title hunt and were only separated at the finish by about a half of a second. Portsmouth just out leaned Oyster River for the win 50.23 to 50.26 with Milford right behind those two teams in 50.79. In the 400 meters, Merrimack Valley’s Kristie Schoffield blazed to a win in 57.91 with Amelia Concannon (59.92) and Eleanor Zwart (60.95) of Oyster River taking 2nd and 3rd. Jane Leighton of Souhegan took 5th and Lucia Trevino of Portsmouth stole 6th from a slower heat. In an unpredictable 300 hurdles, 7th seeded Grace Baker of Portsmouth dominated the event and ran a blistering 47.29 out of the slower heat. Elise Lambert (48.01) of Souhegan was 2nd and Merrimack Valley’s Kaitlyn Covell (48.66) took 3rd. In a heartbreaker, Portsmouth’s Sarah Morin was leading the fast heat coming into the last straightaway and nipped a hurdle and fell. She executed a graceful roll and recovered to finish, but took 9th. This looked bad for Portsmouth’s overall chances as the meet looked like it might come down to a handful of points between winning and losing. In the 800, some serious mid-distance talent went head to head with Corinne Kennedy of Lebanon taking first with a very fast 2:13.18. Merrimack Valley’s Kristie Schoffield was second in 2:16.10 with Madeleine Hunt of Souhegan right behind in third (2:16.82). Marissa Romano, also of Souhegan took 4th. Shifting over to field events, in the shot put Lebanon’s Kath Merchant (38’5”) won by almost 2 feet over St. Thomas freshman Maddie Buchalski (36’7.5”) and Coe-Brown’s Kathleen Collins (36’1”)took 3rd. Merchant kept it going in the javelin as well as the Lebanon junior broke the D2 record with a throw of 128’4” to win easily. Coe-Brown’s Chelsea McCallion took 2nd with a throw of 112’5”. Merrimack Valley’s Asia Grace Hanson (107’3”) tied Rebecca Durham of Milford for 4th, and Portsmouth’s Hannah Taylor (102’5”) took 6th. You thought Kath Merchant was done? Not a chance! The Lebanon phenom swept all three throws on the day. She blasted a 121’6” discus for a comfortable win over 2nd place Megan Sheehan of Sanborn. Robyn Krafft of Milford took 4th and Kim Merchant of Lebanon placed 5th. The Triple Jump was hotly contested with the top three competitors all within 1.5 inches of each other! Windham’s Scarlett Souter took 1st with a jump of 34’11”, Sophia Miller of Lebanon was 2nd with a 34’10.75” and Kingswood’s Caitlin Carpenter took 3rd in 34’9.5”. Georgia Dickinson of Portsmouth was 5th, and Merrimack Valley’s Theresa Irving took 6th. In the pole vault, there were 11 jumpers represented by only 4 schools! Hannah Wittman of Hanover took top honors in 9’6”, and Portsmouth’s Sarah Morin (2nd, 8’6”) Kate Weathersby (4th, 8’0”) and Molly Perkins (5th, 7’6”) combined for a whopping 14 points from the event! Milford got in on the action as well with Lindsay Wright taking 3rd with a jump of 8’6”. In the long jump Acadia Momm-White defended her Indoor title, taking 1st with a 16’7.75” jump. As usual Xiana Twombly (2nd 16’3.5”) of Oyster River was in the mix as one of the division’s top jumpers. Milford’s Amy Arena took 3rd with 15’10.5”, and Lebanon’s Sophia Miller (15’7.75”) took 4th. In the high jump the Pelham duo of Mia Herrling (1st, 5’2”) and Callie Lindsey (tied 2nd, 5’0”) put on a show, with Sanborn freshman Hannah Ehlers (tied 2nd, 5’0”) and Elise Lambert of Souhegan (4th, 5’0”) also jumping well. Back on the track, the 200 was chock full of teams in the title hunt. Viankah Williams cruised to a 1st in 26.32, with Xiana Twombly (26.56) of Oyster River right behind in 2nd . Out of a slower heat Portsmouth’s Momm-White fired off a 27.11 good enough for 3rd, and out of that same heat Emily Ball (27.47)of Lebanon took an overall 5th. Oyster River took more points in this race as well with Amelia Concannon (27.33) in 4th. Portsmouth freshman Frankie Getman stole 6th place with 27.51. In the 3200, Manchester West’s Julia Robitaille took 1st in commanding fashion, setting a new D2 record in 10:40.54! Milford’s Rebecca Durham (10:54.10) was 2nd, Arielle Zlotnick (11:08.06) of Souhegan was 3rd, and Milford’s Alex Matsis took 6th in 11.22.24. Going into the 4×4, the standings had Portsmouth in first and Milford not far behind. The other four teams originally in the mix were out of striking distance and would have to settle for battling each other for 3rd. All eyes were on Milford in the 2nd heat; they would have to run well and hope for some luck as Portsmouth was in the 3rd and fastest heat. The meet would have to come down to a race where the top teams in contention would not be head to head! Milford ran a gutsy 4:15.26 to win their heat and had to sit and wait to see how it would all shake out. The Portsmouth team knew all it had to do was beat that time to win the meet, but that is often easier said than done. Lucia Trevino led off for Portsmouth and handed off to Ellen Baker in 2nd , knowing that place didn’t matter as much as time; they had to beat Milford’s time to assure a victory. Ellen slid back to third on the heat but the times seemed fast. Fast enough? Sarah Morin took the baton and immediately caught up to the pack, looking for revenge on the hand that fate had dealt her in the 300 hurdles. Still in 3rd place behind Souhegan and Oyster River at the fourth exchange, Grace Baker got the baton and ran directly into an Oyster River runner who inexplicably stopped right at the finish line at her exchange instead of heading off to a side. The impact caused Baker to come to a dead stop, and even though no DQ was issued, Portsmouth still had to finish the race and beat Milford’s time. Grace Baker fought back over the next 400 meters and finished with a time of 4:09.54. That was enough to seal the deal – Portsmouth was the 2017 team champion! This Championship meet was competitive wire to wire, was very well organized by Kennett High School and all competitors came to fight. This was a great representative sample of what heights our sport can reach; from the ups and downs every team experiences, to the small victories that matter, to the one team that can claim that on this day they were the best. The 2017 Boy’s Division 2 Championship meet was all about answering big questions. With seemingly only 3 teams with enough firepower to win; Could Trinity take their three All-Stars and a very small supporting cast and grab enough points for a win as they did Indoors? Could Coe-Brown take an enormously well balanced team and have enough go right so that they come out on top? Could Lebanon exploit their jumping, throwing and sprinting prowess to score many points in few events? The day started on the track with the 4×800. Both Coe-Brown and Trinity had studs to run if they wanted, but both elected not to. Coe-Brown was 3rd and Trinity 5th. With this strategy, Kingswood was the champion, dominating the field for the win in 8:16.39. In the 110 hurdles Trinity’s Oliver Thomas won a tight race with a very fast 14.81 against Merrimck Valley’s Brandon Wood, and Coe-Brown’s Orion Clachar took 5th. In the 100 meter dash, Trinity’s Sebastion Eaton took first in 11.15 over Lebanon’s Ryan Millikin in 2nd, but Trinity left some points on the table with Oliver Thomas finishing 8th. In the 1600, not shockingly Patrick O’Brien easily bested the field in 4:16.53, a new division record! Coe-Brown did earn big points as well with a great one-two punch of River Groves in 2nd and Zach Richards in 4th. In a very fast 4×100, Lebanon flexed their sprinting muscles with a 43.55 and beat a loaded Trinity team. In the 400, Trinity’s Tim Zepf easily dominated the field with a 50.53; he was easing off the gas too in the last 75 meters to save himself for the 800! Brandon St. Onge of Goffstown was second and Trinity’s Steven Duckett had a gutsy performance to grab a surprising third. In a wild 300H that saw the top five places shift dramatically in the last two hurdles, Trinity’s Oliver Thomas won his second hurdle event of the day in 40.10, with Coe-Brown’s Orion Clachar and Portsmouth’s Drew Dickinson right on his tail in 2nd and 3rd, respectively. In one of the most exciting boy’s races of the day, Trinity’s Zepf won the 800 in a fast 1:57.26 and was pushed every step by Portsmouth sophomore Ryan Prinz (1:57.67). Coe-Brown took 3rd and 4th with River Groves and Zach Richards respectively. 4th through 7th place was decided by less than six tenths of a second! Shifting to field events, the Triple Jump was won by Sam Ebner of Plymouth with a jump of 41’7”, just edging out Houssam Serhan of Manchester West with 41’5.5” With the team competition still tight between the three teams outlined in the top paragraph, Trinity’s Simon Berry grabb ed 3rd place for some sneaky points. In the shot put, the crowd was treated to monster throws as Marcus Roper of Lebanon blasted a 51’7.75” to beat an impressive 50’2” from Goffstown’s Oliver Gunski. Coe-Brown stole a 3rd and 5th here with Isaiah Allen and Will White respectively. In the pole vault, Milford’s William Shepard won by a foot with a 12’6” vault over 2nd place Billy Seguin of Souhegan. Coe-Brown took some points here as well with Tyler Troy and Tanner Richards getting 3rd and 5th. In the long jump, Lebanon’s Ryan Sullivan added to his outstanding day by winning with a jump of 21’9”. Second place was taken with another very good jump from Kristopher Johnson in 20’11.25”. Lebanon took 4th here with Ryan Milliken. Russell Lippitt of Milford won the javelin in 159’2”, 8 ft over the next best competitor Isaiah Allen of Coe Brown. Orion Clachar also added a 3rd place for the Bears here. Following their blueprint, Lebanon’s Sullivan took first with a season best 6’4” in the high jump, and Plymouth’s Ebner jumped 6’2” for second. Jacob Snow of Coe-Brown and Will Fahey of Portsmouth tied for 3rd. And in the discus, Gunski of Goffstown easily out-threw the field in 141’7”. Tom Robinson of Souhegan was 2nd with a throw of 128’0”. 2nd through 6th place were only separated by 8ft. Coe-Brown’s Jonathon Thorn grabbed a 5th and Roper of Lebanon took 6th. Back to the action on the track, in the 200, Sebastian Eaton dispelled any doubts about his sprinting acumen by powering through a 22.40. Freshman speedster Kyle Doucette from Hanover was second with an impressive 22.97. Lebanon’s Milliken took 3rd, one of many athletes shouldering a heavy physical and mental workload on the day. In the 3200, Cameron Starr of Pelham took top honors with a 9:49.26. A hard charging Florian Bochert from Milford took 2nd, and Coe-Brown’s Evan Tanguay was third. With field events results still trickling in, it seemed inevitable and poetic that the team competition would come down to the 4×400, the last race of the day. With the outcome of the discus still unknown and Trinity and Coe-Brown the only two teams left in the hunt for the 2017 D2 title, it seemed like the winner of this race would win the meet. Both teams had all th eir best runners on the track for this race, and it did not disappoint. Coe-Brown’s Michael Mulligan and Trinity’s Emmanuel Ndahayo led off and Coe-Brown had a slight lead at the first exchange, both handoffs clean and efficient. Chris Pratt of Coe-Brown opened up an early lead over Trinity’s Steven Duckett, but Duckett charged hard over the last straightaway to take a ten meter lead at the 2nd exchange. Sebastian Eaton of Trinity wasted no time in taking the lead over Portsmouth with Coe-Brown’s River Groves (and everyone else) having the unenviable task of trying to run down the fastest boy in the division. Trinity kept the lead at the third handoff as Eaton handed off to Trinity anchor Tim Zepf. Zach Richards of Coe-Brown made a massive effort over 300 meters and almost caught Zepf with one straightaway to go, but Zepf had another gear to go to and held off Richards for the 4×4 title. After the discus results came in, what most suspected ended up to be true: whoever had the better 4×4 between Trinity and Coe-Brown would win the meet. And it was Trinity with the win scoring 92 points, Coe-Brown in 2nd with 89 points in an unbelievable five hour battle between two amazing teams with completely contrasting styles. Congrats to both teams; the emotions exuded as the results were announced showed everyone watching just how invested and committed the athletes and coaches from all teams competing Saturday are in this sport. Big thanks to Kennett High School for hosting and doing an amazing job! And congratulations to everyone who competed; you are outstanding representatives of our sport and we salute you. Is it true that Viankah Williams only ran in one track meet for all of outdoor and won the 100 and 200 meters. That is unbelievable I saw her interview and she said that. Previous post Division 1 Recap! 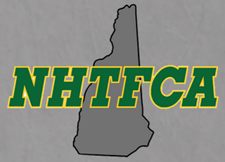 Next post NH Middle School Meet of Champions! June 5th!